let's start with the defination of "Blu Ray". 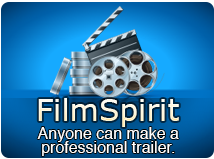 Blu-ray is a high definition video format that stores videos in .m2ts, .mts, .tod file formats. Video files are stored on a Blu-ray optical disc, which has the ability to store 2 times more footage than standard DVD discs with increased visual quality. How to convert Blu ray disc to general video formats like Blu ray to AVI that I could play the videos on more players. Here, that's it. We will introduce how to do this using 4Media Blu Ray Converter. This Blu Converter, not can only convert Blu ray to AVI of course, can convert Blu ray movies to MP4, DivX, MPEG, WMV, H.264/AVC, RM, MOV, XviD, 3GP, FLV HD and SD videos that compatible with iPad, iPod, iPhone, PSP, Xbox, etc. You can visit the product page to get further details. How to convert Blu-ray to iPod step by step? Click Add Blu Ray Folder button, select the disc in the list and load it. Step2. 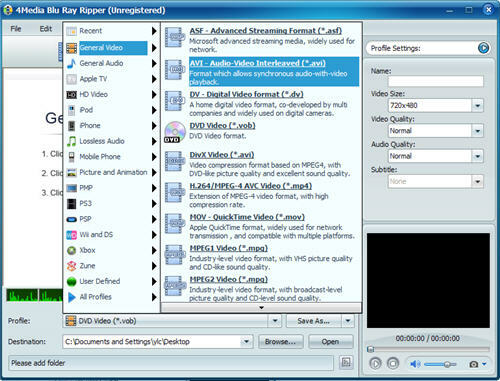 Set the output format as "AVI"
Choose a file in the Blu ray disc, and open Profile drop-down list, then select "AVI(*.avi)" in the "General Video" category. As you can see in the picture above, in the right panel, you can adjust video/audio parameters and subtitles of the output videos before the Blu ray to AVI conversion. When all setting are ok, check the files needed to convert in the file list, and click Convert Checked Item(s) button on the tool bar. All conversions would be finished in a few minutes, and you can directly click Open button to check the converted files.